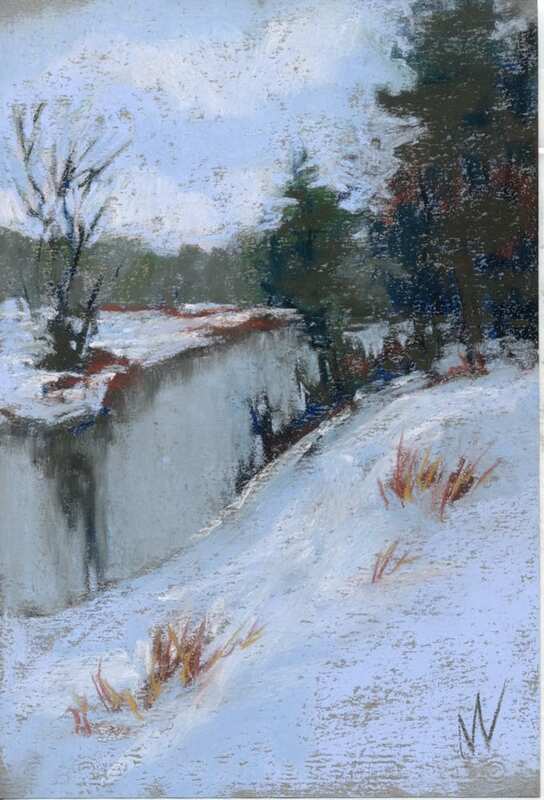 This entry was posted in A pastel a day, ebay sales, Manistee National Forest, painting a day, Pastels, trees, Woods scape and tagged art for sale, ebay sales, landscape, painting, pastel, pere marquette river, river on January 30, 2019 by Marie Marfia. My art is on Ebay! 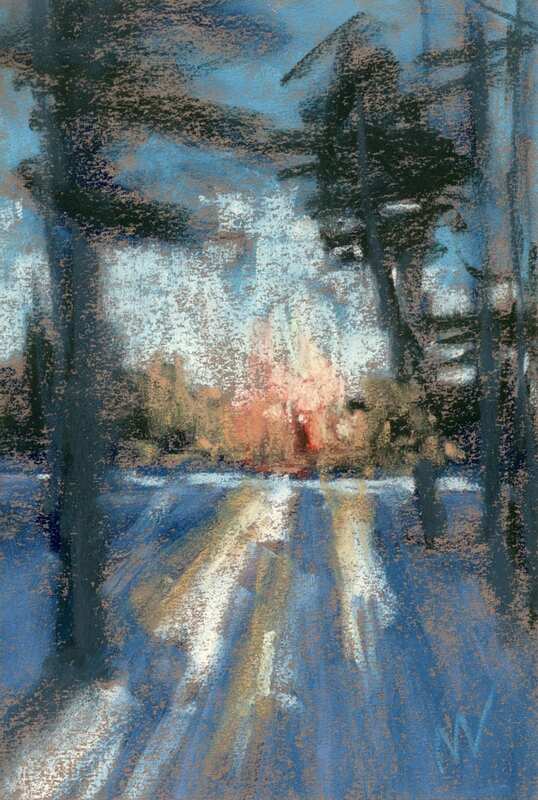 Road Curves Left, 5×7″ pastel on paper, available in my Ebay store starting 1/14/19 at 9pm. It reinforces my daily painting habit. I am under a compulsion to paint every day so that by the time I’m 80 I’ll be freaking awesome at it. Since I’m splitting Ebay sales with a worthy cause (see next paragraph), boom! there’s built-in accountability to keep me on the straight and narrow. It helps others. This year 10% of my landscape sales go to AFFEW, which is a local environmental group. I spend a lot of time wandering around Mason County, gobsmacked by the scenery, and I want to make sure those beautiful views are around for future generations. Happily, AFFEW does too, so they’re an organization I am happy to support. I. Need. More. Space. I realize pastel paintings are flat, but when you’re painting every day, they pile up. I have boxes of paintings stacked in the corners of my studio as well as my storage space. So selling daily paintings on Ebay keeps the stacks to a minimum. It’ll make me famous! Not really, but I enjoy the idea of my art being dispersed to all four corners of the planet. I’ve sold pieces to people living in just about every state in the union plus a few overseas. Frankly, my art is more well-traveled than I am, which I find both sad and hilarious. It fits my impulse-driven lifestyle. With Ebay a painting sells or it doesn’t within 7 days. If it doesn’t sell I throw it in a re-work pile. Then sometime during the next six months I pitch the re-work pile, usually because I’m trying to make room for a pile of new stuff. Problem solved! It’s my drug of choice. I get the same dopamine rush when someone bids on one of my Ebay paintings as I do when eating an entire bag of Lays potato chips, but this is better because not only does it mean another painting is leaving my studio, it’s also not making me fat(ter)! Since my goals this year include reducing my weight and my inventory, Ebay is a win-win. So there you have it, some of my reasons for using Ebay as an art sales outlet. Here’s the link to my Ebay store. Thanks for looking and happy bidding! Long Shadows, 9×6″ pastel on paper, available in my Ebay store starting 1/16/19 at 9pm. 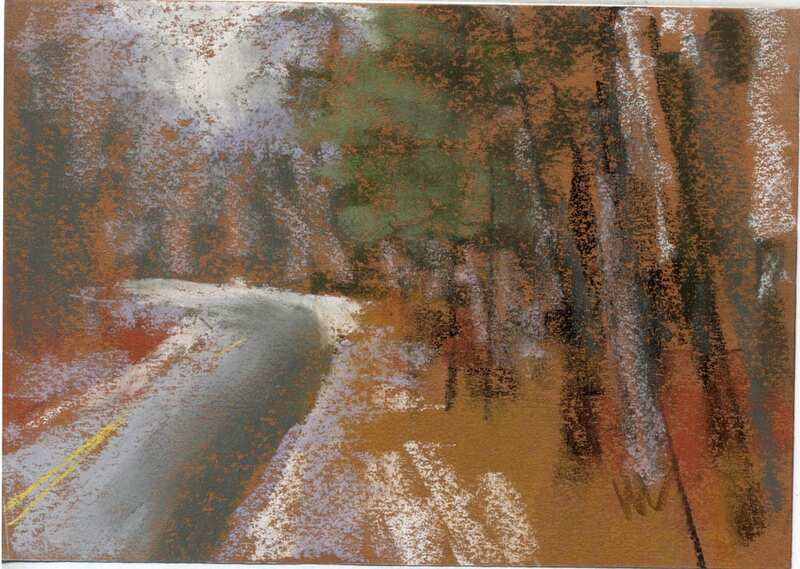 This entry was posted in A pastel a day, Daily painting, ebay sales, forest, inspiration, Manistee National Forest, painting a day, Pastels, path, trees, Woods scape and tagged AFFEW, art for sale, auction, daily, ebay sales, manistee national forest, Marie Marfia, painting, pastel, pastel painting on January 14, 2019 by Marie Marfia.